A tidy vase of dried hydrangeas and autumn leaves on a rustic wooden table greeted me as I let myself in the gate. I sank into a chair on the wide porch, for all the world transported in the Indian summer heat of early October to some place in the nation’s South. The grateful shade under a sweeping California oak reminded me that I hadn’t strayed too far from the Santa Cruz Mountains. This old home is where banjo player and vocalist for Sugar by the Pound, Alison Steele, has sunk her roots to raise her babies, grow her own food, and nurture the love of making music. 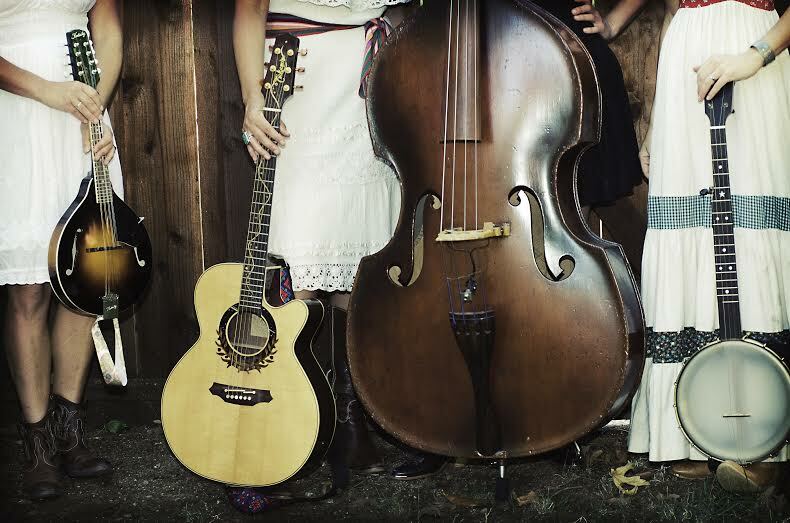 The other members of this all-girl band, Erin Valdivia (vocals, guitar), Cristy Aloysi (vocals, mandolin), and Sarah Farrell Mackassey (vocals, stand-up bass) live within walking distance of this quiet street of rustic bungalows tucked off the mountain town bustle of State Routes 9 and 236. So close to each other, in fact, that locals have reported seeing the girls walking their instruments across the highway on their way to practice! Sharing a passion for family, food, and sense of community, the four friends started making music together just for fun at home. Before too long they found themselves playing out locally as a new force, dialing in their sweet sound together while rediscovering at the same time a sense of their own place as individuals. Each is already an artist in her own right: Alison, a fashion designer; Erin, executive baker and co-owner of Toast and Prost, which pairs craft brews with artisanal bread for local tastings; Cristy, artist and owner of Viscosity Glass; and Sarah, Yoga instructor, artist and owner of lille æske art house collective. Now the girls are performing full throttle, breaking the all-male bluegrass old time-y mold with beauty, talent, and style. Alison explained that their music is not strictly bluegrass but is a blend of their experiences and interpretations built upon the foundations of old time, country blues, and American roots music. 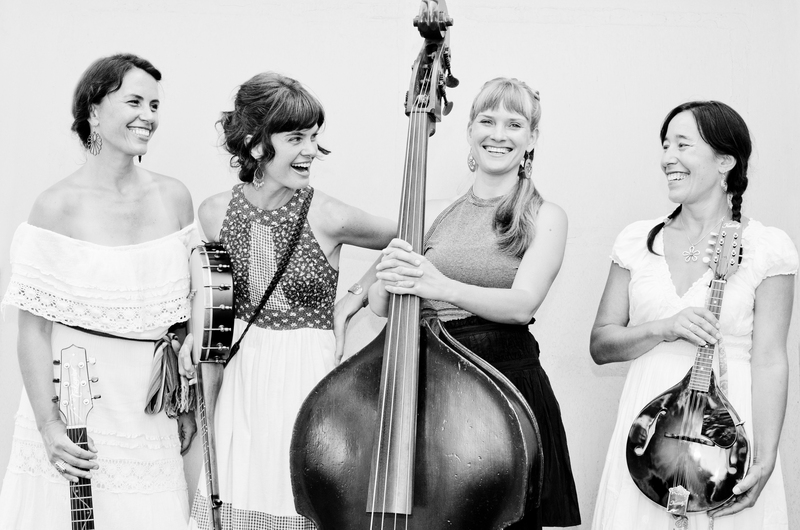 Inspired by the music of Appalachia, Sugar by the Pound sings folk songs in perfectly blended four-part harmony and plays melodies with simple traditional chord progressions using only acoustic instruments. Originally from California, New York, Indiana, and Virginia, the girls compose their own material and cover some of the most richly nostalgic traditional music ever written, bringing East and West Coast together for a uniquely warm, clear sound. And their contagious energy has audiences dancing and singing along. One little taste of Sugar by the Pound and it’s easy to picture this extended family toe-tapping the planks of that wide welcoming porch on a late summer evening in the Santa Cruz Mountains.